A Smarter Way To Train"
that elite military and law enforcement personnel swear by...including early access to the new 28 Day Good To Great training! Hey, it's Ox, from Dry Fire Training Cards, and when people see me shoot, one of the first things they say is that they wish they had the time to shoot as well as I do. I don't say that or show you that to brag...I need you to understand that what you can accomplish with my training in only a few minutes per week goes beyond what you can with any other system. You see, I do 99.9% of my training with dry fire and limit myself to 5-10 minutes of practice per day, a few times a week. I've got friends (and you probably do too) who spend more time in line at Starbucks each week! The truth is, the only reason why it takes most people so much more time and money to get good at shooting is because they're practicing wrong. Using old, outdated methods that they picked up in the military, law enforcement training, or on one of thousands of videos online. These old training methods DO work, and they've won us 2 World Wars...they just take a ton of time and ammo. And because most shooters using those old training methods are practicing so inefficiently, they're basically throwing 90% of the time and money they're spending on training down the drain. Fortunately, you don't have to train like that anymore. As you may know, the results that my clients get are very different than what is possible with traditional firearms training. That's why so many members of top military and law enforcement units use my training. You see, they're ALWAYS looking for ways to be more efficient with their training time and dollars. My goal for you is the same as it is for them--better high stress performance in less time for less money using cutting edge neurology, brain based training, and accelerated learning techniques that anyone with a 6th grade education can understand and use. Anything less is just going to make it take longer and cost more for you to improve as a shooter. And who can afford that? But in this age of information overload, it’s incredibly difficult to sort through all of the training information and separate what actually works from what’s just popular and entertaining. It’s even harder to find training that’s cutting edge and delivers the most value possible for your dollar and for your time. People collect tips and tricks and drills when what they really need is a system. That’s why I want to take you behind the curtain and invite you to join me in my private training community called Upgraded Shooter. In Upgraded Shooter, we combine the best-in-class at-home firearms training tools with constantly updated training as well as pre-recorded and live online coaching sessions. It combines the best of both worlds. It will increase your combat effectiveness and survivability, regardless of whether you're a warfighter, law enforcement, or a responsibly armed civilian. Easy, proven (yet widely unknown) techniques to speed up your reaction time. Stress modulation hacks to dramatically improve high stress performance and reduce the impact of fear, anxiety, worry, and stress. Increasing the speed that you see. Drills to improve trigger finger speed, accuracy and dexterity. Why you shouldn't go straight to your gun in most ambushes and attacks and what to do instead to dramatically improve your survivability. The step-by-step guide to get a sub-second drawstroke...AND make solid hits while you're doing it. Why pain will make you react and move slower, and neurological tricks you can do to counteract this performance robbing effect. We'll DESTROY performance limiting myths like, "you lose all fine motor skills when your heartrate goes over 140 beats per second" and "in a high stress situation, your vision will be reduced down to looking through a paper towel tube" < These ARE true for people who train incorrectly, but they don't need to be true for YOU. This is unlike ANY other training from ANY other instructor available at ANY price. to shortcut the learning process. 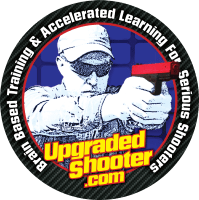 As part of Upgraded Shooter, you'll get access to cutting edge training--Material that's being used by top military and law enforcement trainers, but hasn't made it into ANY online or DVD training yet...in other words, it's way more effective than anything you've seen before. We’ll use scientifically validated methods to slash the amount of time and rounds fired to be able to perform at a high level in situations when your life or the life of a loved one depends on it. Situations where most people freeze and their performance tanks. I know that your life is busy and, most of the time, you’re only going to have a few minutes per day, a few times per week to train. So you’ve got to get the most from it. out of the limited time you've got to train." We're able to do that because we use a completely different (and more effective & efficient) approach than the traditional firearms training model. You see, a lot of things happen in a gunfight before your gun handling skills matter—things that are ignored by most traditional firearms training. And there are several things you can practice without a gun in your hand that will make you a MUCH better shooter in a life & death situation. Stress modulation training to help you stay calmer and perform at a MUCH higher level in surprise life and death situations, as well as respond more effectively to day-to-day stresses. Vision training: Vision training is one of the easiest and highest leverage things you can do to improve as a shooter, but its also one of the most ignored. As part of Upgraded Shooter, you'll get access to the See Quicker Shoot Quicker Tactical Vision Training course. 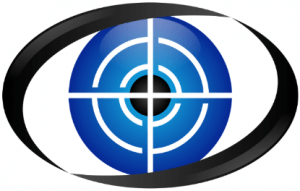 It is the only vision training course available that is geared specifically towards tactical and self-defense applications. If you have limited time to train, VISION is the one skill that you should work on before all others because of how dramatically it will affect every area of your life. You'll go way beyond which line you can see on a silly chart. Vision training is one of the key skills that helped Alabama win the 2018 NCAA Football Championship and Yuzuru Hanyu win a gold medal at the 2018 Winter Olympics. You’ll learn how to increase peripheral awareness and observation/situational awareness skills, as well as improve how quickly and clearly you can see your sights. it's a commonly believed myth that you need to MOVE quicker to BE quicker. << FALSE! The easiest way to move quicker and shoot quicker is to eliminate wasted movement and move smoother and more efficiently. You'll learn to move smoother and quicker in dynamic self-defense situations, no matter how many bolts, screws, and plates you have holding yourself together or what your current capabilities are. 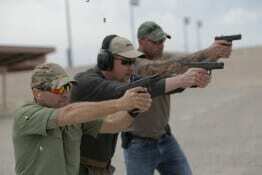 Simple tactics & tools to help you fight to your gun. The reality of a self-defense gun incident is that you’ll probably have to fight to your gun. This isn’t a time for traditional self defense techniques like punching that can quickly make your hand incapable of using your firearm, phone, or keys. In the Fight To Your Gun training, you'll learn how to stop threats as quickly as possible with your empty hands, what's in your hands, or improvised weapons. Upgraded Shooter includes every single one of my training courses...more than $1,100 worth, as well as more advanced training modules all for one incredibly affordable price. in only a few minutes per day, training in your living room." Don’t get me wrong…you and I both know that you’re not going to become an elite “operator” in just a few minutes per day. Rather, we'll focus on the gun handling skills you need to be able to take care of 95% of the situations where you might need a firearm as quickly and inexpensively as possible. Preparing for that 95% will get you ready for the majority of violent muggings, home invasions, carjackings, active shooters, kidnappings, and just being in the wrong place at the wrong time when an evil person doesn’t see you as a human…but only as an obstacle between them and what they want. If you want to train for that last 5%, the principles and methods remain the same, but it will take more than a few minutes per day. So, with that in mind, do you want me to tell you how you can join the Upgraded Shooter Community? Upgraded Shooter is a community of shooters who want to shortcut the process of being able to shoot at a high level under stress using brain & body hacks, accelerated learning, & cutting edge neurology. I'm not talking about pop-psychology and overuse of the newest buzz word of the day. I was part of a Mayo Clinic experiment on controlling migraines by manipulating my hypothalamus through biofeedback in elementary school in the early 80s. I trained with Olympic track and field coaches in the late 80s. And I fought through several neurological issues including a compromised visual cortex & frequent double vision, vertigo for most of 3 1/2 years, years of phantom pain, and more. You see, performance neurology and accelerated learning are why I'm alive today and I'm deadly serious about them. I've used them to help thousands of shooters shortcut the learning process and improve their quality of life in the process, including elite military and law enforcement instructors. And, I'm asking you to join me and become a part of our community. 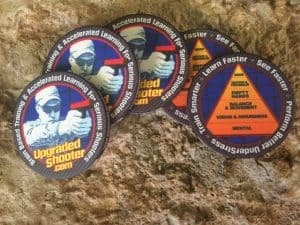 Upgraded Shooter is the answer to the question of how can you maximize your skill level when you have a limited budget and only a few minutes at a time, a few times a week to train. and others like them use my training to stay sharp (and even improve) when they leave service and their their training budgets disappear. Amazingly enough, the training that helps them so much also works great to help newer shooters get up to speed as quickly and inexpensively as possible. What makes Upgraded Shooter different from my other training courses is that it includes several "micro courses." Material that is incredibly powerful, but not long enough to be standalone courses. 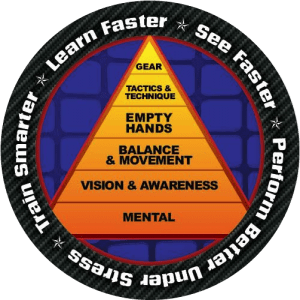 It's designed to be a one-and-done solution to give you rotating access to every course and training that I've put out, early access to new training, and frequent, new video training with myself and other cutting edge instructors. That way, on the days when you only have a few minutes to train, you'll have options to squeeze the most value possible out of every second you have to train. And on the days when you've got a bigger chunk of time, you'll have more options for dry fire and live fire training. Pre-launch access to our newest courses with Ox and other top instructors. (Included for members, but they cost $27-97 for non-members...if they're offered to outsiders at all) These allow you to watch and learn or ask questions and are designed so that you can learn and immediately apply and benefit from the trainings. Access to cutting edge targets, training tools, and drills to help you improve as a shooter as quickly and efficiently as is humanly possible. Some of these tools, that I’ve been using for years, are just now making their way into widespread use by elite tactical units. A $100 discount on private video coaching packages. Access to the Journal of Tactics and Preparedness…our monthly journal that includes instruction from myself, and some of the most respected instructors and tactical consultants in the country--Instructors from places like Gunsite, Vata Group, T1G, Tracker School, OnPoint Tactical, Magpul, and others who are DOD or OGA instructors, consultants, and operators. The journal covers firearms training, primitive & urban survival, brain & bio hacking, identifying and defending against social and psychological manipulation, vehicle combatives, empty hands fighting, improvised weapons, cyber/economic/unconventional warfare, and more high leverage topics that you just won’t find anywhere else. People pay up to $27 per month for the Journal on it’s own…and LOVE it. Big discounts on gear from industry partners that could easily pay for your membership! As you can see, this goes beyond any other training program or training community that exists—online or off. Upgraded Shooter delivers more cutting edge, life-changing value in less time than you can possibly get from traditional live training or online training. And that’s what you want, isn’t it? You want to get the most value possible for your training time and your training dollar. That’s what I’m going to give you…more value for your training dollar and training time than what’s possible with any other training option that exists. There are 3 ways to join. All 3 options give you behind-the-curtain access to multiple live online training events and on-demand training material that covers pistol, rifle, vision, stress modulation, and more in a way that will help you make faster gains than you thought possible with less effort or cost than what's possible with other methods. When you sign up right now, you'll also get one of my patented multi-caliber Dry Fire Cord kits! Yes, my finger's on the trigger in the picture above. 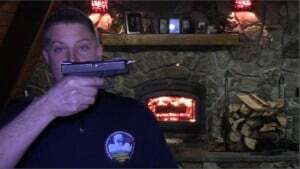 I'm demonstrating how to get a resetting trigger on a Glock in under a minute without removing the slide. Dry Fire Cord makes dry fire practice with a firearm safer (nothing is "safe" with a gun...by design) by giving you a reflective visual indicator that the chamber is plugged and will cause the trigger on a Glock and other semi-autos to reset after each press without having to rack the slide! One of the big advantages of Dry Fire Cord is that you don't need to remove the slide to block the chamber. Last, but not least, when you sign up today, I'll send you out one of our limited edition Upgraded Shooter Challenge Coins! I understand that when I click the button above (or >HERE<) I'll get access to more than $1,100 of training value for my membership in Upgraded Shooter and that I can cancel at any time. There's absolutely nothing to lose and everything to gain by taking advantage of this offer. If you're not happy for any reason within the first 60 days, just let us know and we'll make it right or refund your money. P.S. Remember, when the slots are full at the introductory price, we'll be raising the price and you won't be able to get the pricing on this page anymore. So if you're interested, you need to take action right now.